The labs of META PI Raghuveer Parthasarathy and UO Chemistry professor Michael Pluth published a paper recently* on a new fluorescent reporter of hydrogen sulfide, which can be imaged inside live larval zebrafish. Hydrogen sulfide is increasingly recognized to be an important physiological signaling molecule as well as an important microbial product. Its detection, however, especially by non-toxic and non-destructive means, remains very challenging. 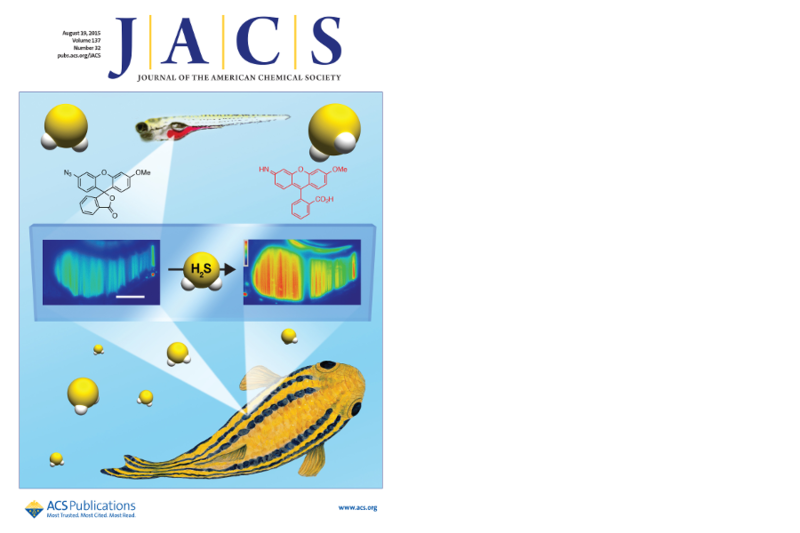 The Pluth lab synthesized a remarkable new molecule that becomes fluorescent upon hydrogen sulfide binding, and the Parthasarathy Lab used light sheet fluorescence microscopy to image the compound in the intestines of larval fish. In addition to demonstrating a new route to hydrogen sulfide detection, the work meshes with META aims of understanding not only the biological constituents of the host-microbe systems, but also their chemical activities. This work was featured on the cover of the August issue of the Journal of the American Chemical Society.